Incorporated in 2001 SMJ UK has rapidly grown to be a key supplier within many product categories. With over 70 years extensive experience in the electrical category we are experienced in the past, present and future of this sector. Substantial investment has seen turnover grow continuously by the introduction of new fresh approaches in innovative new designs and solutions on extension leads, cable reels, wiring accessories and home automation. 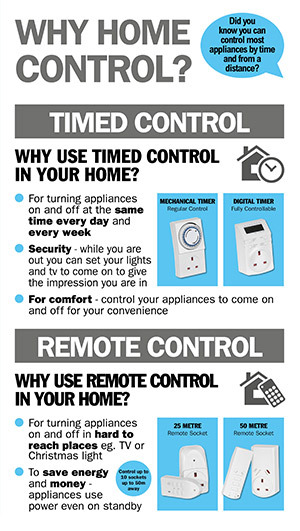 Home Control is a great way to automate your home and appliances for comfort ease of use and also extra security. A great range of mechanical and digital timers to suit all needs from basic 24 hour to 7 day digital with up to 140 programs. Use remotes to access hard to reach sockets such as behind the TV, under the Christmas tree of even in the garden shed. Control sockets from up to 50 Metres away and add multiple sockets to one remote. Great for use when you’re doing a DIY job weather that be cutting the grass or washing the car. IP66 sockets and switches provide complete water protection even when in use so its great when you want power outdoors all the time. This range is complimented with an RCD socket, 24 hour mechanical timer socket and remote control socket for added comfort, flexibility and control. 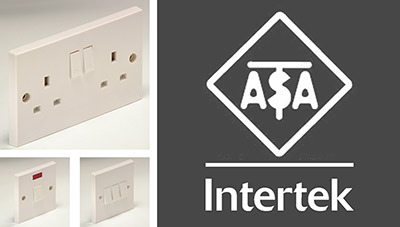 The SMJ range of wiring accessories benefits from ASTA approval meaning that installers, contractors and end users can be sure that what they are buying is of the highest quality. The SMJ range of wiring accessories has undergone extensive 3rd party testing to ensure its quality and consistency. Whether going on holiday or visiting the UK there is a travel adaptor in the range to suit all plug systems around the world. 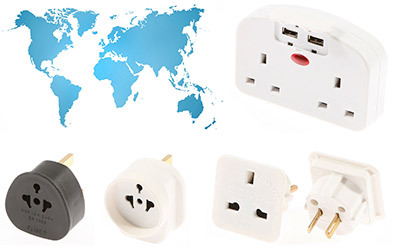 Convert plugs from the USA, Australia, European plug, Shuko, and Indian for use in the UK and around the world. All SMJ extension leads are rated at 13 amps for maximum safety and loading of up to 3120watts. From 1 socket to 10 there is a extension lead for use in and around the home and office environment for all types of use. Added functionality with individually switched sockets gives you extra control and can save you time and energy costs. Available in 4 socket and 6 socket models. Surge protection is a must for protecting sensitive electronic such as TVs and also power tools for when in use. Lighting is an important part of any home whether that be for in the home for security or around it for ambient lighting. SMJ plug in and portable nightlights are great for children's bedrooms, hall ways and even outdoor spaces with our weather proof and PIR range. Weather proof and low energy LED floodlights are the way forward for outdoor lighting. LED means lower running costs of up to 70% less than conventional lighting and also no need to replace bulbs as they can last up to 30 years.